I recently made this poster for Pinup Payback, a feminist/anti-sexism organisation in Medway run by a friend. I was given the theme of “girls just want to have fun” without creeps, so here are some gooey, sticky creeps. My hometown has a really disproportionate rate of sexual assault for the population, and a lot of people whose attitudes are stuck far, far in the past. Growing up there, and also going back to visit, I have had men say the most appalling and disgusting things to me and my friends, far more than any other place I know. 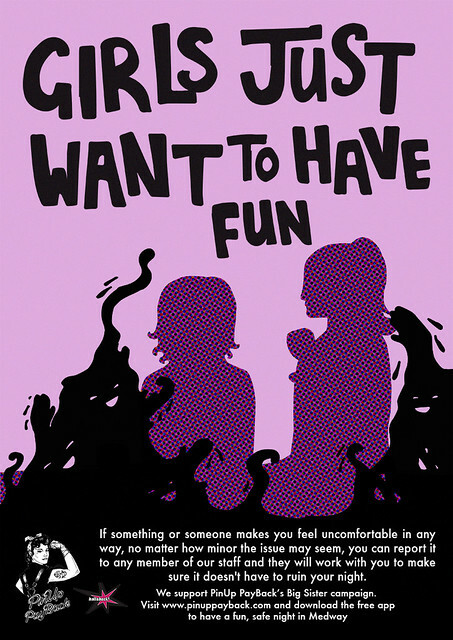 This poster (along with training for staff) will be going up in the pubs and bars in town that sign up to the campaign to show customers that if someone if harassing you, the venue promises to take it seriously, a campaign also being run in London by Hollaback. To find out more about the campaigns, phone app and to donate, visit the website.